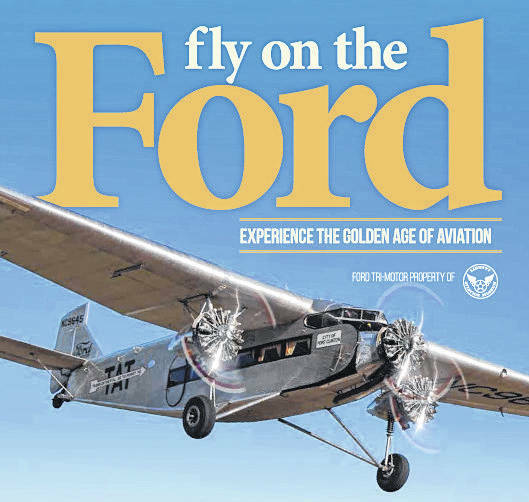 The Ford Tri-Motor that will be landing in Delaware in August is pictured on an event flyer. The City of Delaware and the Delaware Municipal Airport are set to showcase a piece of aviation history when the Ford Tri-Motor plane touches down in August. The 1929 model will be on display Aug. 9-12 at the airport, and visitors will have the opportunity to ride in the aircraft and take in the city in a new light. Experimental Aircraft Association (EAA) Chapter 1600 President George Mellen and Vice President Bernie Rifkin detailed the upcoming events to Delaware City Council on Monday. The first Tri-Motor plane was manufactured by Ford in 1926 after owner Henry Ford bought out inventor William B. Stout. Made out of alloy resistant to corrosion, the plane was given the nickname “Tin Goose.” Beginning in 1929, the Tri-Motor began working in conjunction with the Pennsylvania and Santa Fe railroads to offer cross-country transportation in as little as 48 hours. Tri-Motor planes were also used in military service up until 1937, transporting personnel between bases, while also assisting Marines fighting down in Nicaragua. Rifkin underwent the application process last year, and he said a large part of being able to bring the plane to Delaware was a combination of timing and there being an opening in the plane’s scheduled tour, as well as having the means to house the aircraft, which has a wingspan of 77.5 feet. Although the plane has been completely refurbished, Rifkin believes the plane is still very accurate to what its interior and exterior looked like in the 1920s. Flights will be offered on Thursday, Aug. 9, from 2 to 5 p.m., and then from 9 a.m. to 5 p.m. Friday through Sunday. The flights will cost $50 for children and $70 for adults. Rifkin hopes to add other flying groups for Saturday and Sunday to share the experience, as well as offer the public the chance to look at different types of airplanes. Anyone interested in learning more about the event and the historical significance of the Tri-Motor plane is encouraged to attend a meeting at 7 p.m. on Wednesday, May 9. The meeting will be held in the National Guard conference room at the Delaware YMCA and will feature Tri-Motor airplane historians. Pancake breakfasts are also held at the airport, 1075 Pittsburgh Drive, on the third Saturday of the month, starting in May, from 8 to 11 a.m. The breakfasts offer additional opportunities to learn more about the upcoming Tri-Motor plane event.